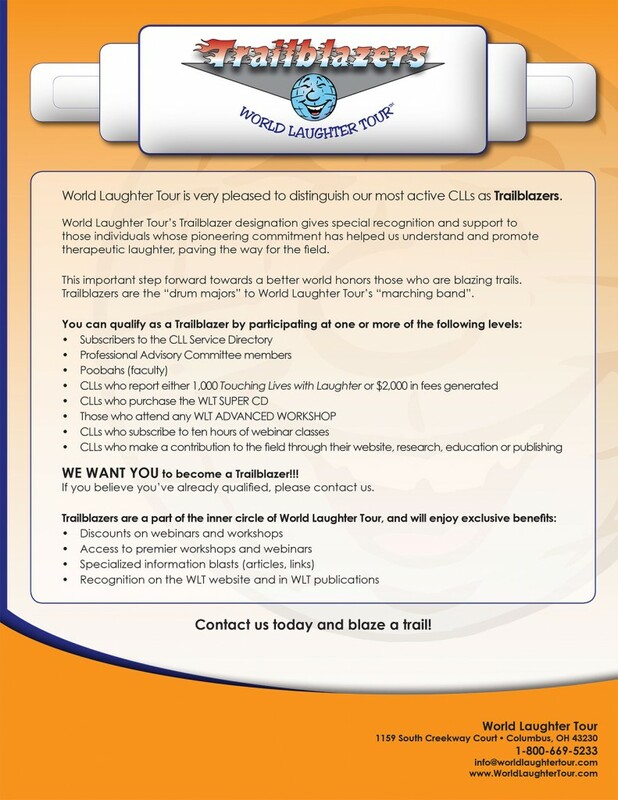 Trailblazers Designation | World Laughter Tour, Inc. I read this article and found it very interesting, thought it might be something for you. The article is called Trailblazers and is located at https://www.worldlaughtertour.com/about/membership-benefits/trailblazers/. Be Part of an Elite Team of Trailblazers! World Laughter Tour is pleased to distinguish our most active Certified Laughter Leaders as Trailblazers. The Trailblazers designation offers special recognition and support to those individuals whose pioneering commitment has helped us promote and understand therapeutic laughter; paving the way for the entire industry. This important step forward honors those who are “blazing trails”. Trailblazers are like the drum majors to World Laughter Tour’s proverbial marching band. We are thankful to have them in our organization, both for their tremendous impact and value to the world. WE ENCOURAGE YOU TO BECOME A TRAILBLAZER! If you believe you are already qualified, please contact us. Blaze a Trail with the World Laughter Tour Trailblazers!